AS DEALS go it couldn’t be tastier. 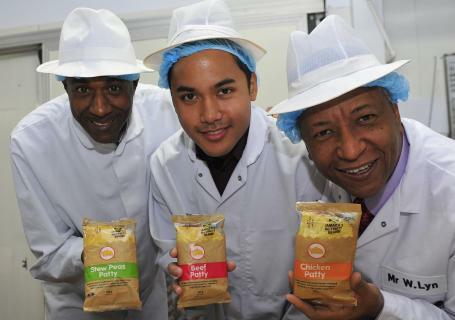 Jamaica’s number one premier patty has arrived in the UK in a ‘hands across the water’ deal with Britain’s award-winning patty manufacturer Cleone Foods Ltd, where staff are now busy making thousands of snacks a week to Juici Patties’ famous secret recipe. Jamaica’s largest fast food chain has expanded into Britain after discovering that Birmingham-based Cleone Foods’ production facilities are world class. Sainsbury’s is exclusively stocking Juici Patties’ Birmingham-made snacks in more than 20 of its stores, with further major UK supermarkets scheduled to take up the delicious deal in the New Year. This is good news indeed for Cleone Foods’ founder and CEO Wade Lyn CBE, known as the UK’s ‘Patty King,’ who has been baking his own special brand of patties for the past 30 years. Now he and his 50 staff will manufacture Juici Patties under licence. Juici Patties’ longstanding quality control manager Joseph McPherson, along with operations manager Daniel Chin, have just paid a visit to Birmingham to ensure Juici’s secret formula tastes just as good made in the UK. Mr McPherson, who is still arguably Jamaica’s finest patty maker even after more than 30 years, couldn’t be persuaded to reveal the secret behind Juici Patties’ distinctive taste, but said it was all about having the finest raw ingredients, which he had found in the UK. Far from being rival patty makers, there are historical close links between Juici Patties and Mr Lyn’s own family who also hail from Clarendon, where his late father George Lyn served for many years as a respected MP in North Central Clarendon. The UK Juici Patties range, which is being marketed in wrapping that mimics their famous brown paper packaging, is available in beef, chicken and a Vegetarian Society-approved stew peas, currently solely for the UK market. Mr Lyn, who is also Honorary Consul for Jamaica in Birmingham and runs a regular consular service from his offices in Icknield Street, Hockley, said: “We’re really proud to be joining forces with Jamaica’s number one patty maker in order to bring its authentic taste into the UK. Cleone Foods has also expanded into Caribbean ready meals which include brown stew lamb, jerk chicken and jerk pork. 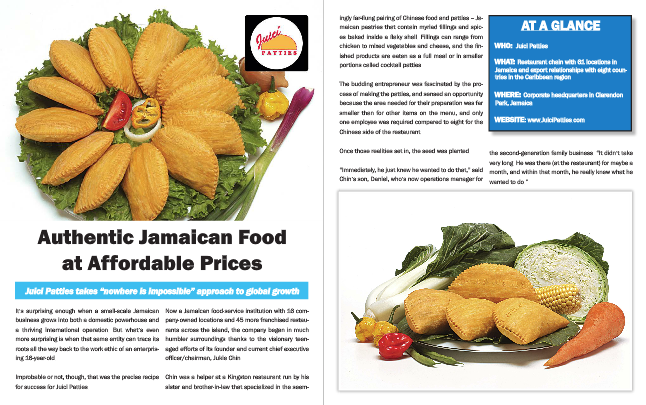 Juici Patties, which is also manufacturing its patties in Canada and eight other Caribbean countries, has well over 60 restaurants in Jamaica and is the only fast food franchise located in all 14 parishes.